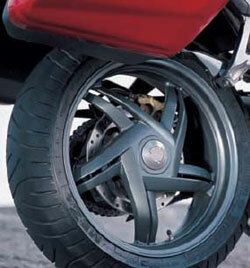 The rear wheel on the Aprilia RST 1000 Futura is a thing of beauty, but it must be re-fitted with care. It’s an ingenious design, which allows the wheel to be removed independently of the chain and the brake disc. Not only is it pretty, but it makes tyre changes a doddle. At first sight taking it off appears a little daunting, but it’s easy to do once you get your head round it. Full instructions are in the owner’s manual. First of all, when re-fitting, the rear wheel must be tightened up to the required torque of 170Nm (125ftlbs). Some are even going further and cranking it up to 200Nm. It’s tighter than you think, and you need to find all sorts of ways to apply the necessary force. You can – just – do this with a two foot torque wrench, but remember that if you add a longer lever you multiply the torque. If this hasn’t been done the wheel comes loose and it’s an important point to check when looking at a used bike. A loose wheel can be heard as a knocking sound at car park speeds. You can check by putting the bike on the centre stand and rotating the wheel, checking by grabbing the tyre and rocking the wheel at 90 degress to the direction of rotation. Look at where the three driving pins meet the casting of the wheel for any movement as you go. Often the rocking can only be seen at one part of the wheel. If left like this for long enough the steel driving pins will wear away their locating holes on the wheel. Full instructions can be found in the owner’s manual – pages 109-110 – which you can download from the link to the right. The wheel can only be removed on its own thanks to the design of the hub, which needs a service every once in a while. At present I don’t have much information on this, so feel free to get in touch if you can help.